Tresham College, which has bases in Kettering, Corby and Wellingborough, was the given the worst possible rating in a report published today (Wednesday). A college attended by thousands of students has been rated inadequate by Ofsted inspectors. Tresham College, which has bases in Kettering, Corby and Wellingborough, was given the worst possible rating in a report published today (Wednesday). The college - which provides for more than 4,000 students in the area - had been rated as good in its previous inspection, but has been criticised in a number of areas by the education inspectors. 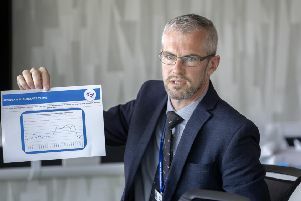 The damning report found effectiveness of leadership and management and quality of teaching to be inadequate, with achievement rates on the decline in the past three years. Inspectors found that too many students are failing to achieve the grades of which they are capable of. Target setting was found to be poor, with students’ English and maths skills requiring improvement. Stuart Wesselby, principal at Tresham College of Further and Higher Education, said: “Naturally we are extremely disappointed by the outcome of the college’s recent Ofsted inspection but I am proud that staff members were commended for their professionalism and team spirit throughout the inspection. “I am reassured by the numerous strengths highlighted within the report particularly the good provision on our adult learning programmes and the recognition that we respond well to offer a curriculum that meets the local skills training needs. “It was also highlighted that students, especially the most vulnerable, receive good support to help them achieve. “That said, the inspection highlighted some issues. The college was told it must ensure all governing body members are subjected to strict vetting procedures as a matter of urgency. They were also told they needed to improve achievement rates and the quality of teaching on offer. Mr Wesselby said: “We have already implemented a number of significant improvements to processes and teaching at the college since the beginning of the year. Mr Wesselby added that Tresham is placed above all other colleges in Northamptonshire for its student achievement in 2014-15, providing an excellent basis to improve even further. He added: “The college management team will now be working with staff to continue making progress and implement strategies to address the areas of concern raised by Ofsted. The college was previously criticised after announcing it planned to shelve A-level provision next year.